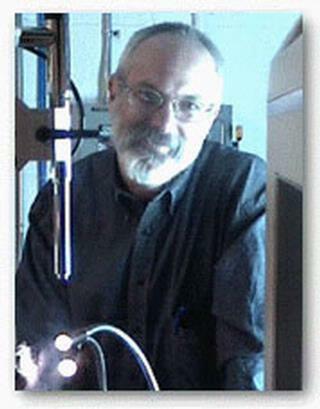 Barry M. Goldstein, M.D., Ph.D. The structure of a biologically active molecule (i.e. a drug) is intimately related to its function. Our laboratory employs the technique of macromolecular crystallography to elucidate molecular structure, and to relate this structure to biological function. Crystallographic methods are used to define the structures of complexes between active ligands and their enzymatic targets. This information is used in conjunction with ancillary modeling and computational techniques to identify, at the molecular level, specific interactions important in stabilizing these complexes. Current research projects examine a series of chemotherapeutic dinucleotide analogues of the cofactor NAD. These agents act as general inhibitors of the class of enzymes known as dehydrogenases. Different inhibitors show marked variations in specificities and affinities for different enzymes. These variations in ligand binding can be attributed to distinct alterations in both intra- and intermolecular interactions observed in the enzyme-inhibitor complexes. Structural results at atomic resolution are correlated with biochemical and pharmacological data. The ultimate aim of these studies is to identify conformational features which enhance drug activity. These features can then be preserved in the intelligent design of new analogues. Goldstein BM. "Overcoming lower-extremity wound defects using hydrocolloid framing." Advances in skin & wound care.. 2011 May 0; 24(5):221-4. Goldstein BM. "Demystifying electrosurge." Dentistry today. 2005 Nov 0; 24(11):114-6, 118, 120. Gruswitz F, Frishman M, Goldstein BM, Wedekind JE. "Coupling of MBP fusion protein cleavage with sparse matrix crystallization screens to overcome problematic protein solubility." BioTechniques.. 2005 Oct 0; 39(4):476, 478, 480.